Well, I just completed my first week of the “Everyday Dharma” challenge. Technically I am now one seventh of the way to finding the Buddha in me! So, what was the first week like? It was quite manageable. “Everyday Dharma” is broken up into seven chapters, one for each week. Within those chapters, text is broken down into individual days, complete with a spot to write the day’s date at the beginning of each! Each day has a passage to read, an exercise to try, and a quotation relevant to the text and exercise for that day. I found it easy to budget a little time in the evenings to devote to this. I don’t know how the next six weeks will play out, but this first week was rather low impact as far as time consumption goes. Day one was about your wisdom-nature. The idea is that essentially we’re all already walking around with enlightenment inside of us. We are all already sages, we just haven’t recognized it. The exercise for the day was to reflect on your wisdom-nature, which was to answer the question when have you felt deeply at home in your own skin? I actually struggled with this quite a bit, as I continued reading the exercise I came across this text, “You may not even be able to find something that is a self when you try to hold onto it. Even that is not a problem! If you find nothing, rest in the groundlessness of the experience of not finding. As a famous Buddhist parable goes, ‘Not Finding is finding’.” Not finding, check! Good start! If the spiritual path is not disorienting, nothing is happening. ‘Not finding is finding’ means that ‘not finding’— a moment of being lost or disoriented— is the first step to non-conceptual knowing, the knowing that experience things as they are. When you look inside and cannot find a ‘self’ or an ‘I’ or an answer, you are close to seeing the selfless inner Buddha, which is too boundless to be grasped or ‘found’ by our conceptual mind. It is beyond being a self or an object of thought, beyond duality, beyond concepts, and beyond subject-object dichotomies. Such a non-conceptual realization only comes about when we let go of grasping. As soon as we have ‘found’, we have grasped onto something, and we are lost in dualism. Therefore, not finding is a sign of being on the way to a deeper finding, free from a finder or something to be found. We find enlightenment not through striving, finding and attaining, but rather by letting go: by not striving, not finding, and not attaining. The more you give up, the closer you get. The less bound by structure (oriented), the more possibility for freedom. You’re in good company with the sages, Rebecca! Day two was about struggle and how it’s a sign you desire to awaken. Basically, if we’re at peace and content, we would already have found our enlightenment. Our angst comes from the fact that we know that not all is well, that we want peace and freedom. So my angst is a friendly reminder that I want freedom. Lama Willa says, “The challenge of the seeker is to recognize the potential of that tremendous drive for freedom and channel it constructively. The spiritual journey is about not eliminating angst but learning to make it work for you.” The exercise was to analyze struggle by considering an issue you struggle with and in a calm state ask yourself, “When I was struggling, when I was discontent, what was the cause of my struggle? Was it caused by outer conditions? My mind? My body?” My ultimate source of struggle currently is my health, which is delightful mix of all of the above. Not sure what to do with that. I’m glad you brought up health, Rebecca, because it is something every one of us struggles with or will struggle with someday. The Buddha classified illness as one of four inevitable human sufferings (he called them “the four great rivers of suffering”) that everyone must face by virtue of being alive. The others are birth, aging, and death. In a human life, not one of us will escape these experiences. Being in a body means we are going to be born, get sick and eventually die. Even if we die young, we still experience some process of aging, along with the changes and occasional losses that brings. Because these four sufferings are so ubiquitous, they became a primary concern of the Buddha. He was interested in suffering because it is a universal condition, and he made it the subject of his very first sermon and many other sermons after that. Today, the human condition has not changed much. We still wonder, how can we best cope with these and other various forms of human suffering? When we are ill, for example, is medicine enough to relieve us? To answer this question, it can help us to distinguish between pain and suffering, as related but distinct experiences. If pain alone were the problem, medicine and other kinds of palliative measures would be enough. We would rely on these measures to address the pain and we would then be fine. Right? But pain alone is not the problem. On top of physical pain, almost immediately, comes another kind of pain, a second-order pain called—in Buddhist texts— dukha, or suffering. Dukha includes not just the illness, but the mind’s reaction to illness. When we are un-well, we don’t just think, “I am ill. I may as well just be content with that. No problem!” Instead, we have a great deal of difficulty accepting it. Even when we know we have no choice (we can’t ‘think’ ourselves well! ), it is difficult for us to be happy. The illness is accompanied by thoughts: Why me? Why now? How did this happen? We feel frustrated. That frustration again feeds our resistance, and the cycle continues. After all, it seems to us that un-wellness interferes with our life, our longevity and our plans, so why would we not resist it? But, the Buddha pointed out an alternative to the cycle of struggle. He pointed out that it is not actually the un-wellness itself that interferes with our life and happiness. Illness, aging, loss, and death are unavoidable but they are not inherently the problem. The problem lies with our inability to trace the causes of suffering, and to find deep acceptance. Unless we intervene in some skillful way, pain always turns into suffering. This process unfolds not from external conditions, but from a set of unconscious, internal conditions. He called these internal conditions “root afflictions” (or we could say “basic cognitive-emotional tendencies”) and classified them as three: ignorance, attachment and aversion. Ignorance is our most basic tendency to bifurcate the world into a dualistic place, a place where there is a “self” separate from a “world out there”. On the basis of that root ignorance, we give rise to the tendency to cling (attachment) and the tendency to resist (aversion). It is these that make pain into suffering. We resist un-wellness, and as soon as we do, we engage in a push and pull with our experience. We feed attachment to wellness and aversion to un-wellness. We are struggling. From struggle with our pain, comes suffering. Finding an alternative to this struggle relies on discovering that that we have a choice. The first step is to notice there is a difference between pain and suffering. Pain is inevitable; suffering is optional. So when you are struggling with health, explore whether the health condition (the body) is really the ultimate source, our whether the way we meet the health condition (the mind) is the source. This is the first exercise the Buddha had his monks do: explore suffering and its causes. The second step is to notice we have a choice between acceptance and resistance. We don’t have to resist all the time, just because that is what we have done before. We can work on acceptance, not as a door to becoming passive, but as a door to releasing the grip struggle has on our life a bit. When we release the struggle, even a bit, we can begin to explore the ways pain is useful. It is useful in many ways: for developing compassion for others, for reminding us of impermanence, and for helping us let go of attachment. From that, one can even develop gratitude for pain and un-wellness. Much more could be said about that. Maybe the next book. Day three was about caring and how it is a sign of compassion. The exercise was to observe your thoughts and drives. Throughout the day you need to ask yourself, what am I caring about at this exact moment? Where is my energy going? Afterwards you ask yourself, What do I really want to care about? You’re asked to list three things you want to channel your energy towards during your spiritual journey. Friendship, The Magical Buffet, self exploration. Next! Beautiful. Almost anything can become the Path. Friendship as Path, Blog as Path, Self-exploration as Path. You’re on your way! Day four was where meditation was introduced. Curses! The exercise was meditation on the three arrivals. Actually, this wasn’t that bad. It instructed you to relax your body, focus on your breath, and try to settle your mind into the present moment. Lama Willa tells you to aim for five quality minutes. I don’t know how good my five minutes were with regards to quality, but five minutes was doable. Meditation can be profoundly simple. We tend to make meditation harder than it is, but it isn’t (or shouldn’t be) a big project. It is not primarily a practice, but a way of being present. To be present in a certain way, once you catch on, is easy. It just takes some patience and perseverance in the beginning to catch on. In the practice of the three arrivals, you are just learning to be present in a certain way. You land in this place, in this body, in this breath, in this moment (a reality we often are not fully inhabiting!) and stay there for awhile. Being fully present, without a lot of complication, is profoundly healing. It is also a much deeper practice than it first appears to be. To know that, you have to stick with it and “plumb the present moment”, again and again, the way an ice-fisherman drops his line again and again. This is one of my favorite all-time—or real-time!— meditations, because it is so easy to do. It only takes a bit of intention and mindfulness to find an island of calm in this present moment, to replenish, and recharge. Day five was about your body, it’s your temple you know! The exercise was to do the three arrivals meditation from day four and then contemplate on the gift that is your body. After your meditation you’re supposed to write out three things that you will do to repay your body for all it does for you. Despite my admitted health issues, I treat my body pretty darn good. Not too much or too little of anything. Honestly, I treat my body better than it treats me. Screw you body! I’m not “repaying” you! You owe me! Glad to hear you are already on to this one! Say a little prayer for the rest of us as we clean up our temples. Day six was about admiration and how it’s a sign that you’re gifted. If you’re like me, you constantly compare yourself to others and come up wanting. You find people every day that embody qualities you wish you had. Lama Willa explains that we think we’re not gifted, “But you are gifted – it comes with your wisdom-nature. How do you know that? Because you could not recognize a gifted person if you were not gifted yourself.” The exercise was recognizing your innate qualities. You think about someone you admire, what is one quality you admire in that person? Then you are to think of a time when you manifested that quality in yourself. This is quite difficult for me. As you’ll see in the next paragraph, with most people I admire, their wit is the thing I admire most. Which makes for a pretty boring, non-inspirational response to the question. It’s like, whenever I make a witty turn of phrase I’ve channeled that quality. Not very Buddha-like I suspect. I’ll beg to differ. What’s un-Buddha-like about humor? I’ll argue that bringing happiness and laughter, with skillful intention, is Buddha-like. Without a sense of humor on the spiritual path, we’d never make it. We’d wallow and die in our earnestness. Humor can be therapeutic, deconstructive of the ego, even enlightening. It has a way of breaking up our usual way of looking at things. It is structure-shattering. I think that ‘breaking up’ activity is what makes us feel free in a moment of laughter. That freedom is not unrelated to the freedom of awakening, the liberation that results from loosing track of the self. Humor loosens us up for bigger things. It also challenges us to be connected to the minds of others (we have to think about what would make them laugh, right? ), and reminds us not to take ourselves so seriously. It depends on the motivation and compassion behind it. I think the key to making wit a spiritual virtue lies in motivation, and of course partly in talent. You have both, so keep it up for our benefit, Rebecca! Day seven was about the power of emulation. Lama Willa explains that you don’t have to impersonate someone to achieve spiritual success, but rather that you can learn selectively from the examples set by the people you meet in life. You’re asked to pick three personal heroes, list what about that person inspires you, underline some of the words that reveal the hero’s strength. Here are three of my personal heroes and their traits: Kathy Griffin, wit, work ethic, fearlessness persistence, accessibility, Aaron McGruder, wit, fearlessness, intellect, Kuan Yin, compassion, selflessness, devotion. Thank you for sharing your personal heroes with us. One of my spiritual heroes was my grandmother Bessie. She embodied a sweetness that is difficult to capture in words. When I knew her as a child, she was a big, slow-moving, white-haired, buxom woman with a smile that would melt a glacier. She was nice to me of course, being her grandchild, but that is not what impressed me. What impressed me was the way she viewed the world and people we would call “strangers”. For Bessie, the world was basically a benevolent place. At least, that is how my child’s mind perceived her. It was not that she was naïve, but she had a way of seeing through the world’s roughness to some deeper gold. She smiled at strangers in the supermarket, was kind to her neighbors, and left the postman chocolates every holiday. She always assumed the best right from the first moment of meeting someone, and because of that, the best emerged much of the time. It is interesting that personal heroes can teach us by what they do not say. I never heard Bessie utter a disparaging word about anyone, something that really stuck with me as I grew older and was exposed to the harshness of the world. That is something that is really not so easy for a person to avoid! I now realize that took a lot of self-control and intentionality on her part. It is so very easy for us to resort to blaming when something goes wrong. This is a strategy that never works, and somehow she had discovered that. She showed me that it is possible to adhere to one’s truth without looking for blame. It is also possible to forgive, without enabling. She embodied that. Maybe she learned that through facing hardships growing up in the early part of last century in a rural community. She lost her parents early, had her first child in a tent in a logging camp in Idaho, and worked hard as one of the few women to become a school principal in the 1930’s. Her life was not easy. She had just realized that having a hard life was not an excuse for bitterness. It was instead a reason to be grateful for the good things one has. Dear Grandma Bessie was a deep teacher for me. She taught me that the world is not perfect, but we don’t have to take world’s imperfections personally. And that concludes week one. See you here next week! 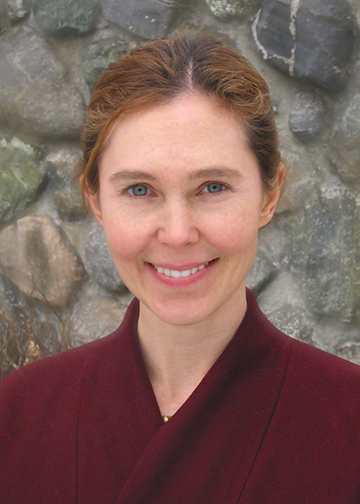 Lama Willa Miller is a meditation teacher in the Tibetan Buddhist tradition. She has studied and practiced meditation for the last twenty years, training with Venerable Kalu Rinpoche, Venerable Dilgo Khentse Rinpoche, Lama Norlha Rinpoche, Khenpo Tsultrim Gyatso Rinpoche, Bokar Rinpoche, and other teachers. She completed two seminary trainings [three-year retreats] at Kagyu Thubten Choling in upstate New York, becoming authorized as a lama, a Buddhist minister, upon completion of her training. Before and after her retreats, she spent time in Nepal, Tibet, and India, studying Buddhism and engaging in service work. She currently lives in Arlington, MA with her husband and two dogs, where she writes, teaches Tibetan Buddhist practice and meditation, principally with Natural Dharma Fellowship. She is also working towards a PhD at Harvard University. Lama Willa is author of the book “Everyday Dharma: Seven Weeks to Finding the Buddha in You” (2009, Quest Books), a practical guide for getting started on the spiritual path. Visit her website here. To follow Lama Willa on Twitter, go to http://twitter.com/lamawilla. On Facebook? Join the Everyday Dharma Facebook group. Previous postGot Plans for May 8th?